Don't have time to create original designs for your Badge-A-Minit pin-back buttons? 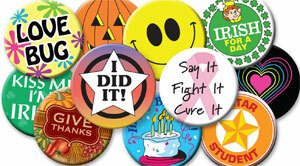 We offer a huge assortment of ready-made button designs for just about any occasion. Holidays, hobbies, religious, classroom, awareness, patriotic and awards designs are available to help you create exactly the button you need, and are sized to fit perfectly into your 2 1/4" Badge-A-Minit button making machine. Mix and match individual designs or purchase one of our Themed Button Kits which come with the designs and pin-back button parts you need all in one convenient package. Or if you have a specific button idea in mind or need a design to fit your 1 1/4" or 3" button maker, we're happy to design a custom button just for you! Faith Graduation It's A Boy! Family Father's Day It's A Girl!